If your father or husband loves to tinker with his power tools in the garage – but all the table saw reviews you read look the same to you, you’re obviously not going to pick out the best power tool gift for him and need to look elsewhere… so is your Dad or your husband a dapper dresser? 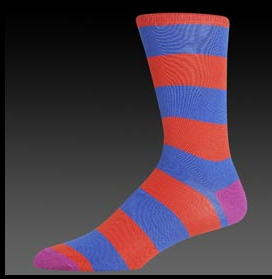 Don’t want to get him a tie, the traditional Father’s Day gift…what about some really cool socks? I know, I know, socks but these socks are pretty hot. These are Thomas Pink Rugby Socks but they have an assortment of colors and patterns. My husband is pretty obsessed with these socks and I think it’s because it’s a creative way to express his style but most folks won’t really see it or notice it in a day. Now if the Dad you’re shopping for is a bit old school, he might not be into the wild socks but if he’s a modern, GQ reading guy he might be down. Don’t believe me? When I went into the Thomas Pink store in DC they told me they sell out of their socks all the time! So go a little bold and help your guy define his style. Think of how great these socks will look husbands resting their feet on the coolest coffee tables while reading a book. These are the visualizations that make me spend money on socks! I must say as a connoisseur of leg fashion above the shoe I am a fan. Its the subtle attention grabbing accessory that screams style when wearing an otherwise conservative ensemble. I love ’em….